This page explains the “Digital Edition” ; a different type of design award participation fee with reduced fees and differentiated winners’ kit, difference between the “Professional Edition” is explained, along with some key points highlighted and frequently asked questions answered. 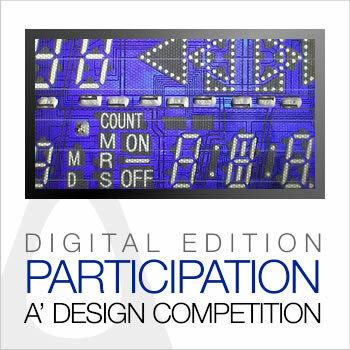 A’ Design Award & Competition offers an alternative design award participation possibility for specific design industries, design disciplines, and concept designs, called the “Digital Edition” which differentiates slightly from the “Professional Edition” through eligibility conditions, winners’ kits and nomination processing fees. If a design award category is possible to join via Digital Edition, this information and a link to this page is included in the Category Description page and these categories are also listed below at “Digital Edition Categories” heading. Both the Digital Edition and the Professional Edition share the same design evaluation principles and methodology; voting system, preliminary checks, design award jury, score points and weights are the same and the design jury members do not know which design is submitted to the Digital Edition and which design are submitted to the Professional Edition. Given this definitions, both entry methods “Professional Edition” and “Digital Edition” are same when the evaluation principles and methodology is concerned. Furthermore, the submission mechanism and presentation requirements are exactly the same for both the “Professional Edition” and “Digital Edition” to ensure that entries received via both methods could be evaluated on equal grounds. Both Digital Edition entries and the Professional Edition entries are suggested to wait for preliminary checks. The preliminary checking service is also the same for Digital Edition and Professional Edition. Entries nominated via Digital Edition could also request the Express Evaluation Service. Design award participation through Digital Edition is available for all competition categories, there are no eligibility differences except for closed categories, listed below, see the list of all design competition categories. The following is a list of design award categories that does not allow Digital Edition submissions. If you wish to submit projects, products, designs, solutions and services that would fit categories below, you should join the Professional Edition instead. Clinical, Diagnostic Products, Bio-Products, Care Projects, Surgical and Therapeutic Concepts and More. E-Governance Platforms, Public Services, Subsidizing Culture and Design. Professional Designers, Design Studios, Design Agencies, Design Offices, Design Companies and More. Designs that were made more than 10 years ago and still looking attractive and modern. Companies, Enterprises, Governments, Businesses, Organizations, Associations and More. Luxury Properties, Exclusive Products, Designs and Communication for Luxury Services and More. High-Visibility Clothing, Fire-Protection, Cold Protection, Helmets and More. Managers, Innovators, Pioneers, Executive Officers, Architects, Product Developers and More. Make-up Cosmetics, Skin Care Products, Beauty Products, Masks, Creams and More. Artificial Intelligence, Robotics, Computer Vision, Bionics, Medical Cybernetics, Adaptive Systems and More. Detergents, Soaps, Fuel Additives, Dishwashing Liquids and More. Effective Products, Processes, Services, Technologies, Ideas and Solutions that Exceed Market Needs. Baby Products, Kids' Products, Childrens' Products and More. Construction and Infrastructure Projects, Building Engineering and Design, Technical Projects and More. Security Cameras, Surveillance and Scanning Systems, Monitoring Equipment and More. Designs with Highest Details, Well Defined and Finished Products, Highly Innovative Designs and More. Furthermore, concealed design award categories are also not open for the digital edition. There are significant differences between the “Digital Edition” and the “Professional Edition” when the winners’ kit is concerned. The “A’ Design Award Winners’ Kit” promoted throughout the A’ Design Award & Competition website refers to the winners’ kit provided to entrants who have won the accolades via participation through “Professional Edition”. The “Professional Edition” Winners’ Kit includes a series of PR and communication services and tangible materials such as books, trophies, framed certificates, exhibit poster preparation, and merchandise which add value to design award participation and makes winning the accolades a complete experience. On the other hand, “Digital Edition” winners are provided a different limited-edition winners’ kit with reduced contents; especially this particular type of winners’ kits do not include any physical components (thus the name Digital Edition). The “Digital Edition” winners do not receive the following as a part of their winners’ kits: the hardcopy – printed version of yearbook, the metal award trophy, exhibition space, framed award certificate, gala-night invitation and several other services such as inclusion in hard-copy edition of yearbook, specialized press release distribution through third parties (DesignPRWire press-release distribution is included), good design mark and multilingual translation services could be excluded. The complete list of differences between the two participation methods are listed at the “Table of Differences”. LIMITED 1, 2 & 3 : Premium USA Press Release distribution through third parties are not included in the Digital Edition of the Extended PR Campaign, however DesignPRWire press release preparation and distribution is included instead. Digital Edition entries will have up to 5 language translation for platinum and gold award status and 3 language translation for silver, bronze and a design award status. DIGITAL * : A Digital copy of the item is available as a download. The digital documents are same as the professional edition versions except for the printed yearbook which differs slightly from the digital yearbook that covers more entries. There are also differences in the nomination process, the Professional Edition nomination process is integrated and automated, to nominate via Professional Edition, simply register to A’ Design Awards, login, upload your project and nominate it from your control panel. The control panel is available after login. The nomination to Professional Edition is possible with all payment methods listed at the Payment for Joining a Competition page. The Digital Edition nomination process is however different, to nominate via Digital Edition, you should register to A’ Design Award and competition, upload your design, and purchase a “Digital Edition Nomination Ticket”. Similar to the Professional Edition, the nomination fees for Digital Edition is varied based on the participation period. The link to purchase a Digital Edition Nomination Ticket is provided at the bottom of this page and relative costs are provided below. Learn more about "Nomination Tickets". The price of the digital edition nomination tickets depends on the competition period (click here to learn the current competition period; late, early or standard). Discounted Digital Edition tickets for bulk submissions are also available. Please kindly note that, there is a yearly limit of 10 Digital Edition entries per participant, and a life-time limit of 50 entries. Check the bottom of this page to purchase nomination tickets via Digital Entry. Upgrading from Digital Edition to Professional edition is possible before results are announced and the upgrade service is subject to the Professional Edition Upgrade fee based on the entry period. Migration to Professional Edition (i.e. change after results announcement) is possible as well: If a design was nominated through Digital Edition, it could be migrated to Professional Edition, within a one-week period, after the competition results are announced, the migration is subject to a fee which is calculated based on the cost of additional deliveries and production required. Digital Edition winners could pay the “Edition Migration Fee” to receive the winners’ kit that is proposed to “Professional Edition” participants. The cost of the migration is calculated as a sum of all items that shall further be included such as Gala-Night invitation, Yearbook preparation and Inclusion, Exhibition items preparation and other services and overhead costs. The total cost is set at 1.800 Euros for Silver, Bronze and A’ Design (SBA) Award winners, including any eventual tax and there are no discounts available for multiple entries. Platinum and Gold Design Award winners (PG) could upgrade to Professional Edition by paying 1.200 Euros instead of 1.800 Euros. Ultimate A’ Design Award winners will be able to upgrade to Professional Edition free of charge, however the additional services that are promised for Ultimate A’ Design Awards will not be included. These cost does not include the eventual shipment of winners’ kit or any other additional services since winners’ kit for example could be picked up from the gala-night or exhibition free of charge. Upgrade to Professional Edition is indeed not recommended and is also not obliged; we suggest entrants to join “Professional Edition” if they are considering to receive physical items and the additional services as listed on the “Table of Differences” above, to save time and resources. Likewise the Professional Edition, there are no further or obligatory fees from Digital Edition Winners. A' Design Award and Competition reserves the right to provide complimentary Edition Upgrade and Migration services for select featured projects, young designers or design ambassadors. Please kindly note that if you have ordered the "Express Evaluation Service" and got early results announcement for your entry, you can not "Upgrade" to Professional Edition; you should use the "Migration" option instead. Click here to learn the current competition period; late, early or standard. Before Results Announcement 750 € Buy Now. Before Results Announcement 800 € Buy Now. Before Results Announcement 850 € Buy Now. After Results Announcement, for Silver, Bronze and A' Winners. 1.800 € Buy Now. After Results Announcement, for Gold and Platinum Winners. 1.200 € Buy Now. Winners will be able to use the award winner logo, will be able to download award certificates and they will also receive a digital version of the award winners’ book, in which their award winning entry is also included. Digital edition winners will also be able to benefit all the services and benefits of winning the award as described in the “Table of Differences” above. Digital Edition Winners’ will not be able to order the Winners’ Kit which is proposed to the Professional Edition participants. Who can benefit from Digital Edition? The Digital Edition could especially be beneficial to young designers and start-up companies who do not have the required funds to join the Professional Edition, furthermore the Digital Edition could also be useful and resource-efficient for participants who do not plan to join the Gala-Night and who do not need to join the Exhibition and who do not need the Yearbook. The Digital Edition was also conceived to support some specific design disciplines and industries as listed at the list of “Digital Edition Categories”. There are no differences between winning the Digital Edition and Professional Edition when the World Design Rankings and the Designer Rankings are considered. There are also no differences in terms of Design Classification rankings based on award categories. Learn more about Design Rankings. Digital Edition winners will also be able to apply to the Distinguished Designer Program, and will be able to utilize the discounts for award participation and offers from third-parties for award winning designers, artists and architects as usual. Learn more about Distinguished Designer Program. If you are already registered and logged-in to the A’ Design Awards & Competition, choose an option below to acquire a “Digital Edition Nomination Ticket”. Before purchasing a Digital Edition Nomination Ticket, please ensure that your intended category for participation is included in the List of “Digital Edition Categories” as displayed above and please read this whole document to understand clearly the differences between the Digital Edition and the Professional Edition. Before buying a nomination ticket, you might want to understand different account types. depending on entry period Buy Now. Discounted Digital Edition tickets for bulk submissions are also available. Please kindly note that, there is a yearly limit of 10 Digital Edition entries per participant, and a life-time limit of 50 entries. 140 € / Submission Buy Now. 110 € / Submission Buy Now. 220 € / Submission Buy Now. 550 € / Submission Buy Now. • Questions? Comments? Please contact us and let us know.